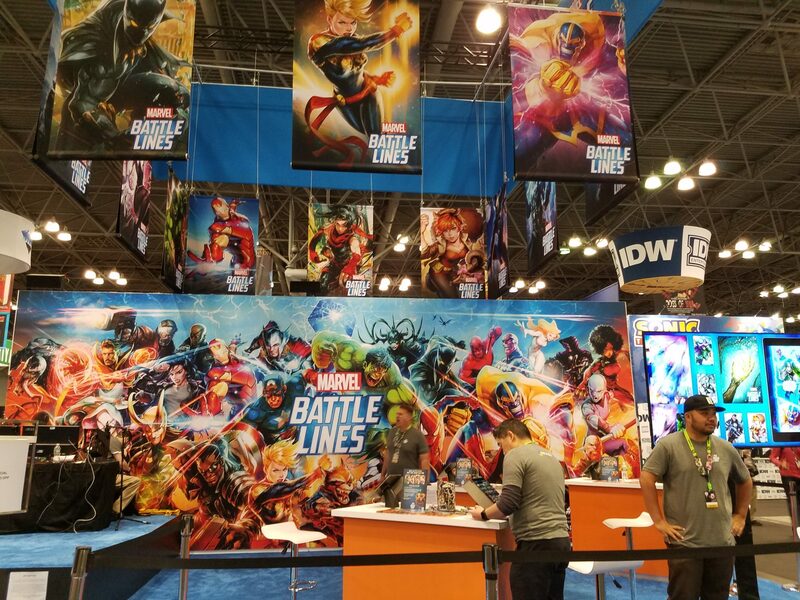 While at New York Comic Con this past weekend, I got the chance to play a demo of MARVEL Battle Lines, the new mobile game from NEXON Co., Ltd. and Marvel Entertainment. 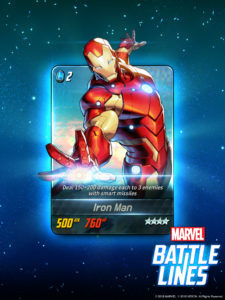 Due to be released October 24th, MARVEL Battle Lines is a card game designed to test your strategy. Build and collect the ultimate deck made up of both heroes and villains from the Marvel Comics universe. Each card is decorated a beautiful illustration of the character, including information necessary for gameplay. On the front of the card, the number in the corner is the number of cosmic crystals you’ll use to summon the card; cosmic crystals can be collected throughout the game. You’ll also find attack and health stats. On the back of the card, you’ll find a quote from each character and a little bit about their background. The intent is to also serve as a bit of an encyclopedia of Marvel history. Characters available include popular names like Iron Man, Hulk, and Captain America, but also characters like Blade, Mysterio, and Carnage. Master their abilities, strategies, and combinations to take on greater and greater challenges. Some characters are voiced by the actors who voice them in the animated shows. You’ll play your cards on a 3×4 gameboard in either single player or player vs. player missions. Each character has a special move that is used when they’re placed on the board. For example, Captain America throws his shield and does damage to two opposing characters, while Hawkeye specifically damages the weakest opponent on the board. 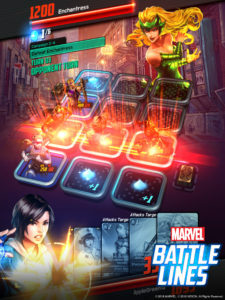 The battlefield illuminates where you can play your cards, but the goal is to create a battle line – a line of three or more characters in any direction (like in Tic Tac Toe) – in order to cause the most damage to your opponent, while also protecting yourself from your opponent’s battle lines. It’s very much like chess (which I am very, very bad at). After making a battle line, your cards are exhausted for one turn. There will be over 100 characters and 200 cards available when the game launches on October 24th, so there will be plenty to collect when you start, but there will be periodic updates to introduce new characters and locations. 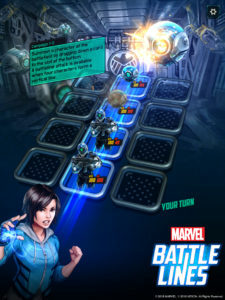 The single player mode in MARVEL Battle Lines features a brand new story by Marvel writer Alex Irvine, wherein the Red Skull and Captain America are battling over control of the Cosmic Cube, but it shatters, and our heroes must collect the pieces before the villains do. Single player mode also includes Special Ops and Trial Simulations. Special Ops is where you can get into some battles quickly, but it will also teach you more about the cards and the mechanics of the game. In my demo, Iron Man was fighting a Hydra agent, and the goal was to win in only two turns. Playing a character card counts as one turn (and usually burns some of your cosmic dust), but action cards do not, so you can play an action card and then play a character card, or you can also move a character card one space in any (available) direction. You only get one action card per turn. If you play a card that requires no crystals on a space containing a pile of cosmic dust, you collect that dust and it goes into your pile to build up your crystals. You can also switch cards, if there is nothing in your hand you can play – but be careful! Every time you switch a card, your new card becomes visible to your opponent. You can switch each card in your hand one time per turn. There is also a collection aspect to the game. All the cards are assembled into Marvel families, so if you want to assemble the Avengers, you can! All you have to do is collect all their cards. You also earn currency for collecting. The real-time turn-based competitive PvP mode will include ranked matches, but you’ll also have the ability to battle your friends! You simply go to your Friends and select the person you want to battle. Both single player and PvP will be available day of launch. I really enjoyed my demo of MARVEL Battle Lines. I don’t have a lot of games on my phone, but I’m going to have to make an exception for this one! It’s very much a game of strategy, and I like games where I have to think.